"Red Alert: waves potentially 12 to 14 m high and strong winds. 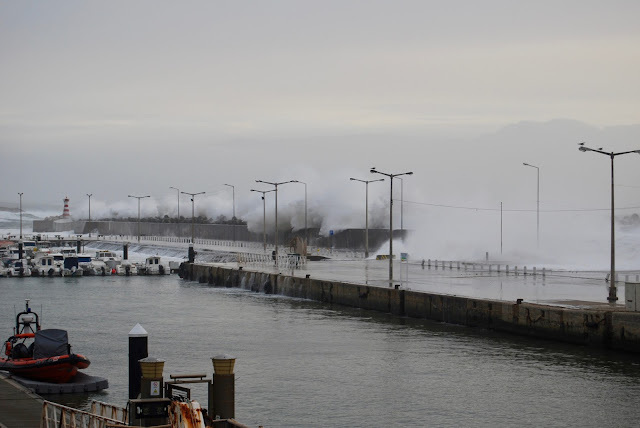 Potential disaster when peak wave heights coincide with high tide at 18:00 h," said the national weather forecast. Windguru showed waves of 8.5 m from 293º. Go figure. I arrived at the marina at 14:00 h to participate in the excitement, maybe even watch the whole kit and caboodle float away in broken pieces. I'm not a masochist, but who would want to miss a show like that. After rearranging the fenders, lashing the main and stay sails better and adding a few strategic dock lines, I waited inside doing nothing useful, occasionally popping my head out the companionway only to see harmless foam spraying over the breakwater. 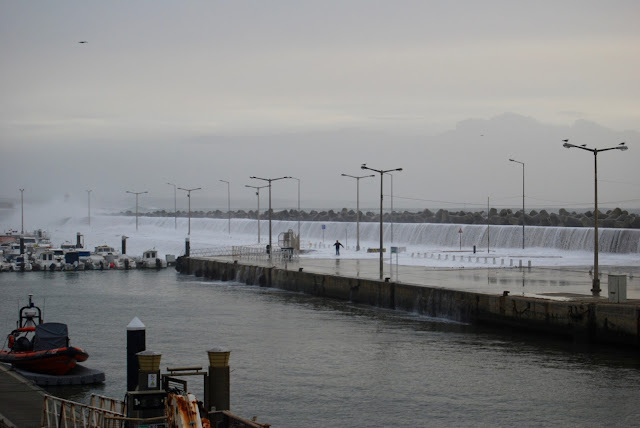 At about 16:00 the waves began to pound louder and the foam turned to green water - foamy sheets washing over the parking lot and into the marina. This is how it looked at about 17:00 h, shot with my Rollei 415 action cam. Pedro who runs a café in town offered to edit my next film, it's that bad. Except for the waves toward the end. A reader, Fernando, sent photographs of me making my escape. Two marina dock fingers broke and that's about it. Wow, man. That's pretty impressive. When I see stuff like that, I hate the fact that I own a boat and I feel a fancy nautical knot in my stomach! Then I lay down until the feeling goes away. god... it's practically impossible to comment to blogger! That's a good strategy of lying down until bad feelings go away. That's what owning a boat is all about...feeling alive, scared, broke, overworked...better stop here or I'll have to lie down. Man, the boots are expensive walking boots, not the marine type. Had to soak them in fresh water.